With Skype for Business on our desktops, we’re now holding more online meetings than ever. A key benefit of a Skype for Business meeting is its convenience. You can join the meeting from anywhere, without needing to travel or set off early – savings in time and travel costs could be huge. However, just because you might not need to put in so much effort to get there, doesn’t mean that your attendance at a meeting doesn’t need some preparation. Here are a few tips to help you ensure that your meetings go as smoothly as possible. We can help you obtain suitable equipment – whether your meetings tend to be small 121 affairs (where a suitable headset and webcam may be all you need) or larger many-to-many events (we have more sophisticated/expensive equipment that you can borrow for these). If you are planning to hold meetings where there are more than 20 participants in a meeting room please contact us (ithelp@hw.ac.uk) for advice. The meeting host should make sure that everyone is properly introduced. You can see who has joined the meeting through the control panel so you can ensure that you don’t miss anyone. If a guest or visitor is attending, take the time to explain their presence and thank them for their time. If you’re using your webcam for the meeting, which we’d usually recommend, be sure to look interested and engaged. Body language may be more limited in a virtual scenario, but your expressions and eye contact with the camera are still important. Don’t get distracted by other work activities or your email while other participants are speaking. It’s important to give the meeting the same level of respect and attention that you would give to a face-to-face meeting. 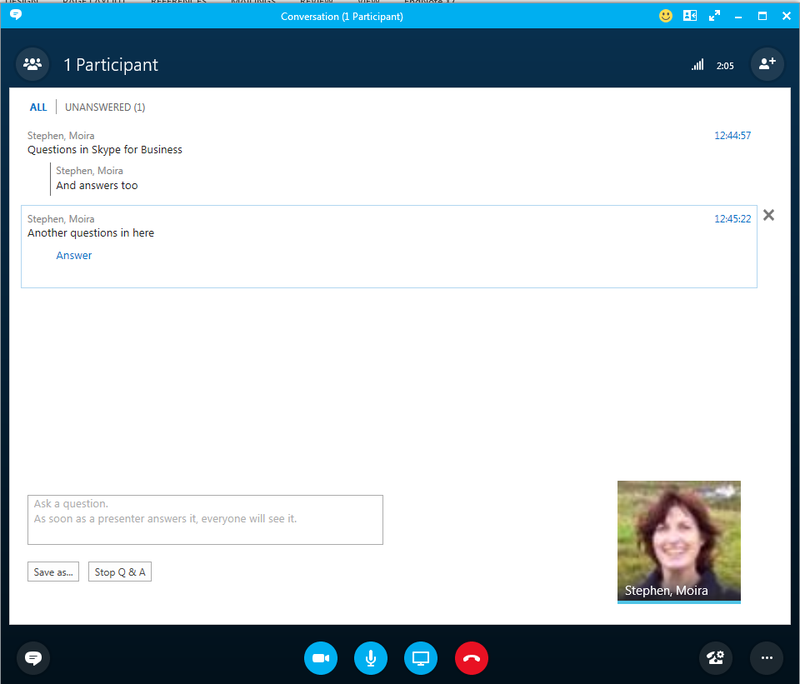 Skype for Business offers the functionality to share screens with other participants. If you are going to present or demonstrate something via your screen, we’d recommend that you shut down any unnecessary programs in advance of the call, to avoid the panic or embarrassment of sharing a private email or a sensitive document. See Meet and share using Skype for Business for more info. Open microphones can create a lot of unwanted background noise. It only takes one participant to be typing an email or blowing their nose, before background sounds become distracting. Once the introductions have been made and the meeting has started, you should only unmute your microphone if you have something to add to the discussion. It can sometimes be tricky to find a suitable opportunity to ask a question during a virtual meeting, without running the risk interrupting or talking over someone. Skype for Business has a Q and A Manager that could be useful for this. Use this feature to allow attendees to ask questions and presenters to answer them, with the option of saving the Q&A session to a file. See Lync Q & A Manager for more info. An alternative could be to use the instant messaging feature for questions. The host can then present these questions at an appropriate point in the meeting, or at the end. If everyone is using a webcam participants could raise a hand so that the host can see they have a question to ask. In an online meeting scenario, it can be easy to forget about some of the participants. It therefore falls to the host to ensure that everyone has been encouraged to share their thoughts. Keep questions short and sweet. Get into the habit of finishing an online meeting as soon as all agenda points have been covered, so that discussion doesn’t digress into other areas. As host, it can often be a good idea to aim to finish five minutes ahead of schedule, and practice achieving this.